Let Canadian Motivel Inc. work with you in solving all your bonding problems. We distribute 3M tapes and adhesives but we have also invested our resources in converting equipment to bring you tape services at a higher level. 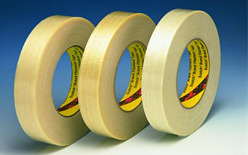 We can provide cut pieces of tape or provide tape on wider liners for ease of removal. Die Cutting and Stamping, laminating and printing are all part of the "Motivel package". Ask us to help you present a more polished product and to suggest ways of reducing your waste, labour and material costs. Please visit our Tape Slitting page for more information. Find below some common and not so common tape products that we can help you with. Paper, vinyl, foils, foam, filament, packaging, splicing and double coated. From the simplest to the most technical, we are prepared to solve your problems. 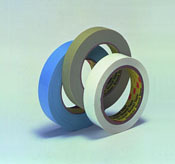 A general purpose paper tape for holding, bundling, sealing, non-critical masking and a vast number of other jobs where a pressure-sensitive tape is needed. General purpose, paint or high temperature. Also specialty masking tapes that won't leave residue. Ask about masking die cuts to save time and labour. High performance tapes with tensile strengths from 100-600 lb/inch width. Used to close, bundle, reinforce, hold, unitize, and seal, and in some instances become part of the final product. Wide range of adhesive properties and strenth. 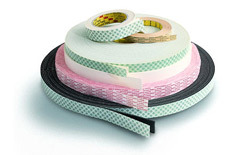 3M Adhesive Transfer Tapes are rolls of pressure-sensitive adhesive pre-applied to a special release liner. For application, the tape is simply pressed, adhesive side down, to a surface and the liner is peeled off. Available in a variety of sizes. 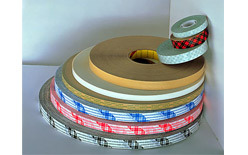 Variety of open- and closed-cell foam tapes with acrylic and/or rubber adhesive. Application ideas include attaching hooks, wire clips and racks; mounting retail shelf price channels; mounting pen holds and window glazing.